Member of the Rosaceae (rose family). Native to Eastern Asia, Japan. Relatives include apple, peach, potentilla, pear, strawberry. 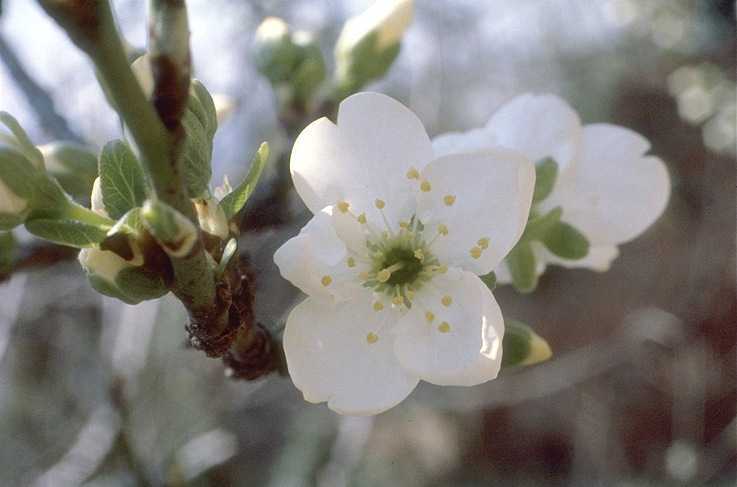 Has small, delicate flowers along woody branches. Stems cut to various lengths. Plant is a deciduous tree, classed as a dicotyledon, leaves not parallel veined. Flowers have a slight fragrance. One reports states 41F but mid 30s should be better. Prunus is the classical name for plum. The specific epithet name “domestica” means domesticated. Cut dormant branches can be forced into bloom by immersing them in 82 F water for 12 hours, then placing them upright in opening solution at 59-64 F and high humidity for 1-3 weeks.